Precise capability specification is the key for identifying and composing the right Web services. This paper specifies service capabilities in terms of the environment entities from the application domain and the effects imposed by the Web service on these entities. An environment ontology for Web services is adopted to provide formal sharable representations of the domain-specific environment entities. A hierarchical state machine is constructed for each environment entity to describe its behaviors, and the effects imposed by a Web service are described as the state transitions traces of environment entities, which define the capability of the Web service. Web service composition that satisfies a set of requested effects is then conducted by reasoning on the effects of services. The proposed approach emphasizes the external manifestation of Web services and service composition based on the effect reasoning. An example of online travel service illustrates the proposed approach. Earlier efforts on the XML-based service standards, such as Web Service Description Language (WSDL2.0, 2007) are designed to provide descriptions of message exchange mechanisms for describing the service interface. However, the kind of keyword-based approach supported by WSDL2.0 is not sufficient for effective service discovery and composition. Ontology Web Language for Web services (OWL-S1.2, 2008) takes up the challenge of representing the capabilities of Web services by bridging the gap between the semantic Web and Web services. The OWL-S capability model assumes a Web service as a stateless one-step atomic process, which includes the information transformation performed by service and the state transition as consequence of the execution of the service by using four parameters, i.e., Input, Output, Precondition and Result (IOPR). However, the four parameters do depict the capability of a Web service to a certain extent, but still show limitations in certain elaborated situations. Refer to the Web services as a one-step process, those services with intermediate states can not be described in due process. In our previous work (Wang, Jin, & Liu, 2006; Wang et al., 2008; Wang & Jin, 2006; Hou, Jin, & Wu, 2006), an environment ontology-based approach is proposed for Web services. The capabilities of a Web service should be grounded on the environment entities surrounding this service and the effects on these entities imposed by the service. The conceptualization of the environment entities, i.e., the environment ontology, is given as the sharable understanding for specifying the capabilities of Web services. After grounding the capabilities of Web services onto the environment ontology, we can infer the capabilities of Web services, as the environment ontology is shared and machine-understandable. A state-based mechanism is introduced to be viewed as the capability specification of Web services, which captures the effects of Web services on the environment. Along this line, this paper introduces when a request is given, how the Web service composition is conducted by reasoning on the effects of candidate Web services to get the desired effects of the request. The rest of this paper is structured as follows. Section 2 introduces briefly the environment ontology. An example is given for illustrating the environment ontology. 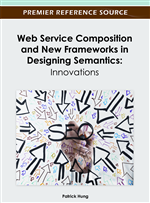 Section 3 describes an environment ontology-based approach for specifying capabilities of Web services semantically. Section 4 presents the Web service composition which is conducted by reasoning on the effects of Web services to satisfy the requested effects. Section 5 discusses related work. Finally, we conclude the paper in section 6.